Mexico’s civil defense agency says the death toll has risen to 226 from Tuesday’s magnitude 7.1 earthquake that knocked down dozens of buildings in Mexico City and nearby states. It is also offering its sympathy to Mexico following Tuesday’s powerful earthquake that killed at least 149 people and collapsed dozens of buildings in the capital and nearby states. Philippine Ambassador to Mexico Eduardo de Vega says he and the embassy staff rushed out of the building when debris started falling and they all escaped unhurt. The Philippine Embassy occupies the first two floors of an eight-story office building in Mexico city’s Cuauhtemoc neighborhood. Mexico’s president has issued a video statement urging people to stay calm in the aftermath of the powerful magnitude 7.1 earthquake that toppled dozens of buildings in Mexico City and in nearby states. Mexico’s president says 22 people have died at a school that collapsed in the nation’s capital due to Tuesday’s 7.1 earthquake. President Enrique Pena Nieto said that two of the bodies found were adults. It’s not clear whether the deaths are already included in the overall toll of at least 149 across the country. The head of Mexico’s civil defense agency says the nationwide death toll from Tuesday’s earthquake has risen to 149. Buildings collapsed, including the town hall and local church, in the town of Jojutla in southern Morelos state, which was close to the epicenter of Tuesday’s magnitude 7.1 quake. Twelve people died in the town. The Instituto Morelos secondary school partly collapsed, but school director Adelina Anzures said the earthquake drill the school held in the morning came in handy just two hours later when the real quake struck. “I told them that it was not a game, that we should be prepared,” Anzures said of the drill. When the quake came, she said the children and teachers rapidly filed out. “It fell and everything inside was damaged,” she said. Nobody was hurt. U.N. Secretary-General Antonio Guterres says he is saddened by the loss of life and damage resulting from the earthquake in Mexico. Guterres extends his condolences to the government and people of Mexico and wishes those injured a speedy recovery, according to a statement released by his spokesman. The statement said the United Nations stands ready to assist Mexico following the quake, which has killed at least 139 people and devastated central Mexico. Mexico’s federal government has declared a state of disaster in Mexico City, freeing up emergency funds following a major earthquake that killed at least 139 people, including 36 in the capital. President Enrique Pena Nieto said he had ordered all hospitals to open their doors to the injured after the magnitude 7.1 quake. Nominations for the Latin Grammy Awards have been postponed because of the earthquake in Mexico and the aftermath of hurricanes Harvey and Irma. Rescuers are clawing through the rubble trying to rescue any children trapped when a school teaching 1st through 8th grades partly collapsed in southern Mexico City during a magnitude 7.1 earthquake. Some relatives claimed they had received Whatsapp messages from two girls trapped inside the rubble but the claim could not be confirmed. Officials say the death toll has reached 139 for the quake which the U.S. Geological Survey said was centered near the Puebla state town of Raboso, about 76 miles (123 kilometers) southeast of Mexico City. The head of Mexico’s National Civil Defense agency says the death toll from a major earthquake that rattled the center of the country has reached 139. Luis Felipe Puente said 64 people had died in the state of Morelos, just south of Mexico City, though local officials reported only 54. In addition, 36 people died in Mexico City, 29 in Puebla state, nine in the State of Mexico and one in Guerrero. The government of Mexico’s southern Oaxaca state reported one death from a major earthquake that devastated the country’s center. The death raised the nationwide toll to 120. Officials did not provide details of the death in Oaxaca, which is far from the quake’s epicenter. People used shopping carts from a nearby supermarket to carry away rubble in a Mexico City neighborhood where three apartment buildings collapsed on the same stretch of street. Valerie Perez, a 23-year-old student from Venezuela, ran from her fourth-floor apartment just in time to see the building in front of it collapse. With only a month in Mexico, she was stunned by the day’s events, which included an earthquake drill then a real one. Earlier in the day workplaces across Mexico City held readiness drills on the anniversary of the 1985 quake, a magnitude 8.0 shake, which killed thousands of people. Trump’s tweet comes after a magnitude 7.1 earthquake shook central Mexico, including the capital, claiming at least 119 lives — the largest number of fatalities in a Mexican earthquake since the 1985 quake that killed thousands. Mayor Miguel Angel Mancera told local media that at least 30 people had died in Mexico City where buildings collapsed or were badly damaged at 44 points throughout the city. The death toll in Mexico’s magnitude 7.1 quake has risen to 119. That’s the largest number of fatalities in a Mexican earthquake since the 1985 quake that killed thousands. Mayor Miguel Angel Mancera told local media that at least 30 people had died in the capital, where buildings collapsed or were badly damaged at 44 points throughout the city. Between 50 and 60 people were pulled alive from the rubble by citizens and rescue workers in the city. State officials said at least 54 people died in the state of Morelos, south of the capital; 26 died in Puebla, according to the director of disaster prevention, Carlos Valdes. Nine died in the State of Mexico, according to the state’s governor. The death toll from a magnitude 7.1 earthquake that hit central Mexico has risen to 104. Mayor Miguel Angel Mancera says that at least 30 people have died in Mexico City, and officials in Morelos state, just to the south, said 54 had died there. At least 11 others died in Puebla state, according to Francisco Sanchez, spokesman for the state’s Interior Department. Mexican officials say the national death toll from a major earthquake has risen to 94. Mexico City’s mayor said 30 are dead in the capital alone. Mayor Miguel Angel Mancera said at least 44 buildings collapsed and that between 50 and 60 people have been pulled alive from rubble. Amid the destruction of a magnitude 7.1 earthquake, residents of Mexico City are digging through rubble to save their neighbors. Carlos Mendoza was standing just blocks away when an apartment building collapsed in Mexico City’s trendy Roma neighborhood. “When we saw this we came to help. This is ugly, very ugly,” he said, covered in dust. Mexico’s federal government says the death toll in a magnitude 7.1 earthquake has risen to 79. The announcement posted on Twitter did not break down the locations of the deaths, but said they included Mexico City and the states of Morelos, Puebla and Mexico. Mexico’s magnitude 7.1 earthquake has forced cancellation of a soccer match between two major Mexico City clubs, Cruz Azul and America. The national soccer league said the game that had been scheduled for Tuesday evening would be reprogrammed for a later date. It’s part of the Copa MX championship series. The governor of Mexico State has announced six more earthquake deaths, bringing nationwide total to 61. Gov. Alfredo del Mazo had earlier announced two deaths. Nutritionist Mariana Morales was one of the thousands of Mexico City residents who spontaneously participated in rescue efforts following a magnitude 7.1 earthquake that devastated central Mexico. The 26-year-old says she joined the efforts after seeing a building collapsing in a cloud of dust before her eyes. “There was the sound of thunder ... then dust and all this,” Morales said. “The people are organizing quickly,” she said. A spokesman for Puebla’s interior department says that 11 people have died so far in the central Mexican state following a magnitude 7.1 quake. The deaths reported by spokesman Francisco Sanchez bring the toll across Mexico to 55. Gala Dluzhynska was taking a class with 11 other women on the second floor of a building in Mexico City’s Roma district when the structure collapsed during a magnitude 7.1 earthquake. More than two hours after the quake, the women stood on the sidewalk across the street covered from head-to-toe in dust. One had a cut on her foot that was being bandaged. Dluzhynska said the building’s stairway was very tight and surrounded with glass. As they ran out of the building amid the quake, everything started falling around them. Some people panicked. She said she fell in the stairway and others began to walk over her. She shouted for help and someone pulled her to her feet. She said the dust was so thick you couldn’t see anything. “There weren’t any stairs anymore only rocks,” she said. When they reached the bottom, an exit gate was locked and they began to scream for help. People were pushing her from behind against the bars. Finally a security guard came and unlocked the gate. Outside it was all rubble. She said they were still looking for one classmate who was missing. Throughout Mexico City, rescuer workers and residents dug through the rubble of collapsed buildings seeking survivors following a 7.1 magnitude quake. At one site in the Mexico City neighborhood of Roma, rescue workers cheered as they brought a woman alive from what remained of a toppled building. After cheering, the workers immediately called for quiet again so they could listen for the sound of survivors under the rubble. The governor of the central Mexican state of Morelos says at least 42 people have died as a result of the magnitude 7.1 earthquake that shook the country. Gov. Graco Ramirez says that 12 of the dead were in the city Jojutla and four were in the state capital of Cuernavaca, which is a city of about 350,000 people. The 7.1 earthquake was too far from the larger quake 11 days ago to be an aftershock and appears to be a separate and unrelated event, said U.S. Geological Survey seismologist Paul Earle. The epicenters of the two quakes are 650 kilometers apart and most aftershocks are within 100 kilometers, Earle said. Tuesday’s quake was at a known tectonic fault, but not at the edges of two moving plates, like many strong earthquakes, Earle said. This fault was inside the Cocos plate, which about 300 kilometers further east slips under the North American plate. As that happens, there is a “pulling apart motion” of the plates, he said. Tuesday’s quake happened on the anniversary of a deadly 1985 Mexico City 8.0 magnitude earthquake, Earle said. Mexico State Gov. 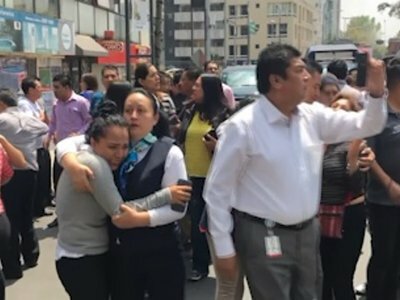 Alfredo del Mazo tells the Televisa news network that the magnitude 7.1 earthquake has killed at least two people in his state, which borders Mexico City. Del Mazo said a quarry worker was killed when the quake unleashed a rock slide, and another died when hit by a falling lamppost. “What we have reports of is material damage ... we have no reports of deaths so far,” tweeted Puebla Interior Secretary Diodoro Carrasco.